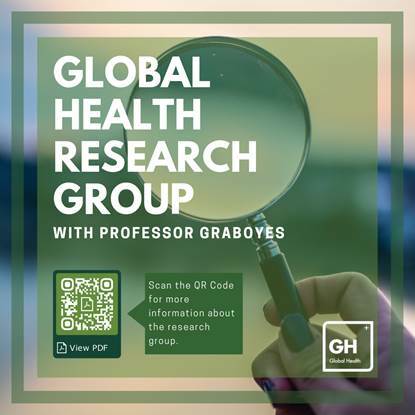 The Global Health Research Group is an opportunity for motivated undergraduates to participate in a multi-year mentoring research experience led by Professor Graboyes. The Research Group is intended for talented and ambitious students who are interested in writing theses on global health related topics; and those who are majoring in STEM fields and want to challenge themselves to think not just about science, but the ethics, history, and processes of doing science. The Research Group has a strong commitment to teaching inter-disciplinary and social science approaches. It is most appropriate for students who anticipate conducting research and writing a thesis on a topic related to global health, medicine, or science, in addition to topics that are more explicitly historical, anthropological, or related to African Studies. Those involved in the research group will develop their academic research and writing skills, with opportunities to explore individual project topics. The Research Group is comprised of sophomores, juniors, and seniors from across the UO, with a majority coming from the Clark Honors College. The Group is committed to helping students gain skills and tools for conducting undergraduate research. By participating in this group, it is expected that all students will: 1) broaden their understanding of what a scientist is and does to recognize the importance of history of science and social studies of science; and 2) be exposed and trained to use social science research methods (primarily historical and anthropological) in future research and careers. You can read more about the research group and the larger NSF grant that supports it here and here. Professor Graboyes leads sessions devoted to topics such as: inter-disciplinary research methods, the basics of ethnographic research, technology to stay organized, planning for international research, and interviewing protocols. Visiting guest speakers give presentations on topics such as: the IRB research clearance process, how to develop questionnaires, interview coding, and systems for staying organized. Students also have the unique opportunity to present on their individual theses and projects in anticipation of conference presentations, applying for grants, and defending their theses. o Applying for a 1-week all expenses paid research trip to the WHO Archives in Geneva, occurring during spring break 2020. To Apply: Please send the following materials in a Word Document or PDF to Graboyes@uoregon.edu by May 1, 2019, 5 pm. Applicants will be contacted by May 10, 2019 and will be invited to join a Research Group meeting before the end of Spring term.